Liam Fox’s trade department hosted Brazilian commodities giant Vale at a government-backed “mining is great” event in Brazil, just weeks before the company was caught up in a deadly dam disaster. The move was part of a wider push by the Department for International Trade (DIT) – created in the wake of Brexit – to increase UK ties to Brazil as the country prepares to leave the EU. 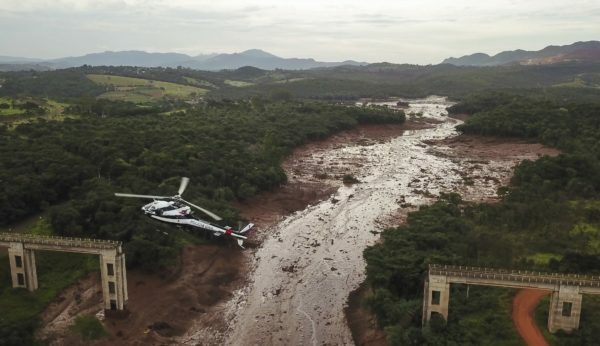 So far 165 people have been confirmed dead and around 200 are missing after a tailings dam at an iron ore mine operated by Vale collapsed on January 25 in the town of Brumadinho, sending a mudslide filled with waste rushing downstream. The accident came shortly after the inauguration of the new Brazilian president, Jair Bolsonaro, who has promised to loosen Indigenous and environmental protections to benefit the agricultural, fossil fuel and mining sectors. Speaking at a November meeting with Brazilian investors, UK Trade minister Graham Stuart said the election made it an “interesting and exciting” time to visit Brazil, according to minutes from the meeting obtained through a freedom of information (FOI) request. In the same month staff from Vale travelled to Belo Horizonte, a city just over 30 miles from the Brumadinho dam, to attend a UK government-organised event aimed at boosting cooperation between the British and Brazilian mining sectors. The UK-Brazil mining forum was promoted on social media with the hashtag #miningisgreat. Minutes from meetings and agendas obtained by Unearthed show that Darryn Quayle, the Department for International Trade’s (DIT) mining specialist also held special one-on-one meetings with senior figures from Vale during a visit to Brazil which coincided with the event. Quayle met Alexandre Salomao – research and development projects manager – and the company’s director of policy implementation. Vale staff also appeared on a panel chaired by DIT called: ‘Spotlight on Women in Mining: Myths and Truths’. A spokeswoman for Vale told Unearthed the company would not comment on private meetings with its management. UK trade minister Graham Stuart also travelled to Brazil in November to attend the forum. There Stuart attended meetings with a range of companies, including mining giants Anglo American and BHP Billiton and urged companies to make use of DIT’s mining specialists in Brazil. In a subsequent meeting with investors outside the mining sector, Stuart described the new political situation following Bolsonaro’s election as “exciting”. DIT failed to respond to Unearthed’s request for comment. Vale is still facing multiple legal actions for its alleged role in a separate dam collapse: the 2015 Samarco tragedy in Mariana, which was described at the time as the largest environmental disaster in Brazilian history. Unearthed has obtained emails showing shortly after the 2015 disaster, officials from UK Trade and Investment, now DIT, met with Vale and offered to identify UK expertise to support the company as it dealt with the fallout from the dam collapse. The London Stock Exchange was among the companies recommended by UKTI. Following the email exchange, a London official noted Vale were “in the news for the wrong reasons at the moment” asking if the UK had an existing relationship with the firm. Brazilian politicians and civil society groups have called for Vale to be held to account for the latest dam collapse, with one top prosecutor suggesting that top executives at the company could be prosecuted. Vale has publicly committed to giving R$100,000 or £20,700 to each of the families with missing members or affected by fatalities. But the FT reports that lawyers in the US are already preparing class action lawsuits against the company, which is the biggest iron ore producer in the world, while local and environmental authorities have already issued fines worth tens of millions of dollars to the company. The collapse could impede plans by Bolsonaro to strip back environmental standards – especially around the planning process. During the presidential election, he mooted scrapping Brazil’s environmental ministry altogether.